Taking you around the world to where the biggest news is happening. 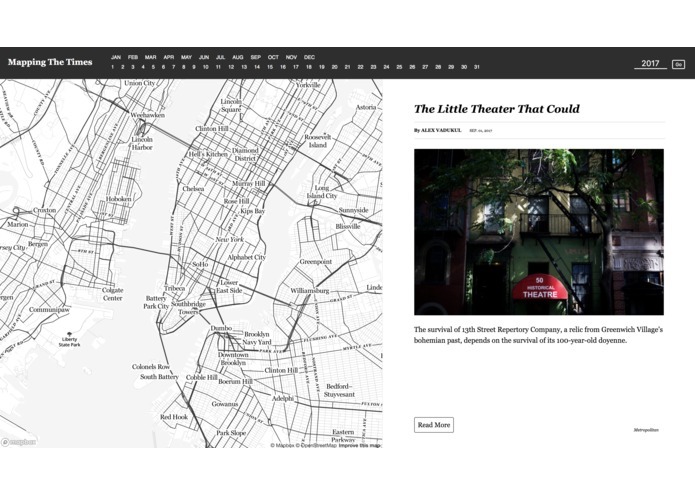 Mapping The Times uses the New York Time's Archive API to create a feed of articles alongside a map that takes you around the world to where the biggest news is happening. Our goal was to place an emphasis on showing how events unfold around the world and revealing the underlying connections of our globalized society. Our app is powered by Node.js, Express, React, and Redis. We wanted to place an emphasis on speed, so we introduced a caching layer between our React frontend and the NYT Archive API. Our biggest challenge was finding a effective way to filter down the thousands of articles returned by the Archive API. We initially started out using the Most Popular API, but later decided to pivot to a more comprehensive approach. We'd love to continue active development and see all the amazing places we can take the app. We dreamed up a lot of great features that we hope could change the way news is digested for everyone. Worked primarily on front end Map/Article interactivity using React. Worked closely with Joshua and Erik on properly handling data sent by NodeJS/Redis backend and displaying throughout interactive and styled components.